The ferries are booked: we’re of to Iberia – Spain, Gibraltar and Portugal – in a couple of weeks. Plus, a poignant photo from Ukraine (and news about the fate of Yanukovych’s SUV collection). Diesel looks set to be ‘eradicated’ from Paris, while speeding and parking fines are apparently on hold in Geneva. A week around Spain, Gibraltar and Portugal coming right up. Having spent the last few years exploring the Balkans it’s time to turn our attention back to Western Europe. The idea was to try out these new cheap ferries to Spain. However, it’s all being done at the last minute – we’ve been waiting for our new car to arrive – so the Brittany Ferries economie sailings are all full. Instead we’re doing a compare and contrast. Out by the full fat cruise ferry, Brittany Ferries’ Portsmouth-Santander, back by the bare bones LDLines Gijon-Poole. It ain’t cheap either. Including cabins, inside outbound, outside inbound – that’s what they had left – the combined fare is £675. That does probably save a night’s accommodation each way, and 1,500 miles of fuel, so it’s not an outrageous price compared to driving the whole way but does feel a bit hefty all in one go (you can book Brittany Ferries trips with a small deposit and pay the rest later). We wouldn’t normally recommend letting the ferry take the strain but the idea of having enforced rest at either end is very attractive – the sailings are about 24 hours – so we don’t have to hold back during the trip itself. That said, this won’t be a mega mile marathon. The Iberian Peninsula is only about 500 miles deep by 600ish wide. Guestimated total mileage is about 2,000 miles. In a week that’s nothing. As ever we’re planning a mix of roads, mountains, motorways, coastal, city and even a bit of desert driving if we can find it. The fixed points are Madrid, Gibraltar and Lisbon. Madrid is having a bit of a tourist depression so we’re hoping to score a bargain fancy hotel room. We also want to see for ourselves the situation at the Spain-Gibraltar frontier and check out The Rock. If I said we were going to Lisbon to check out its Low Emission Zone you wouldn’t come back, so how about we’re giving The City of Seven Hills a chance to cast its graceful spell, or something? Also quite interested in the role it played as a neutral centre of espionage in WW2. We’re also strangely drawn to Santiago de Compostela, or at least somewhere nearby on the craggy, wild Atlantic coast in north west Spain. That’s if we don’t get side tracked on the Ronda Road and Veleta, Europe’s highest paved road, near Granada. Let’s see how it works out. 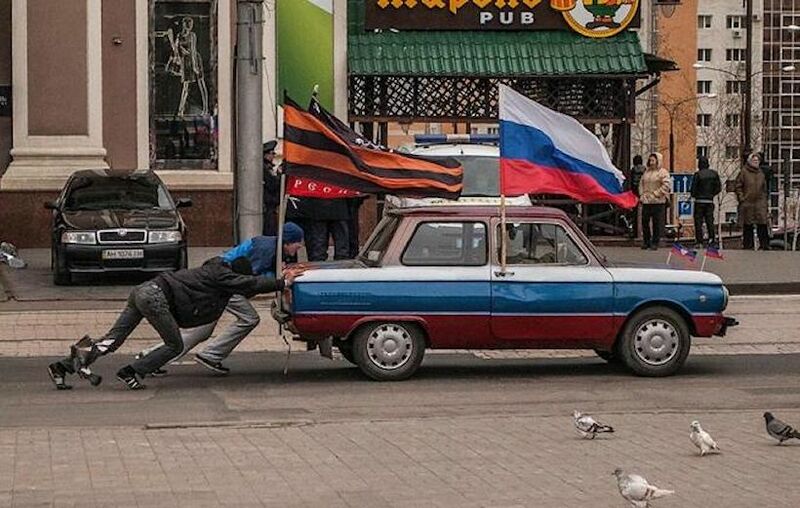 Ukraine: pro-Russia supporters push their ZAZ Zaporozhets through the streets of Donetsk. There was a plan last week to hold a referendum in the south east industrial city, about 50 miles from the Russian border, about joining the UK. Donetsk was founded in 1869 by John Hughes, a Welsh businessman. Photo by Андрей Шокотко, Andrew Shokotko. roundup: FRANCE. The future of the diesel engine in Paris looks very bleak. Anne Hidalgo – who promised to ‘eradicate diesel’ – won the Paris mayor contest for the Socialist Party this evening, apparently after making a deal with the Green Party.. GENEVA. Police have stopped handing out fines for small scale offences like speeding and parking in a strike over pay. A similar strike in 2012 lasted two weeks. UKRAINE. Former-President Yanukovych’s fleet of blacked out SUVs has gone to a good home, sort of: Right Sector, the extreme right wing part of the Maidan freedom movement, is currently driving around in them ‘until the government auctions them off’.